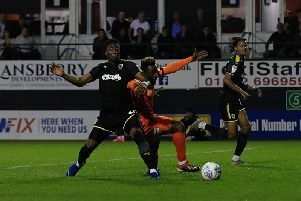 Luton Town have agreed to sell young striker Freddie Hinds to Championship side Bristol City for an undisclosed free. The 18-year-old second-year scholar starred as Paul Driver’s U18s won the league and cup double last season and made his senior debut as a substitute in the Checkatrade Trophy win over West Brom in October. We have others coming through and we don’t see Freddie getting a chance ahead of them in the first team any time soon. Manager Nathan Jones said: “This is a fantastic opportunity for the boy. It’s a deal that suits both clubs in terms of the value we put on Freddie, and Bristol City have met that. “We haven’t been forced to sell. He’s a young player and he’ll go into Bristol City’s Under-23 side as the next part of his development, but we don’t see him as impacting on our senior squad. Robins boss Lee Johnson said: “Freddie is someone we were close to signing in August and we’re delighted to get the deal over the line now. The Potton-based youngster joined the Hatters as an U8 and leaves with two senior appearances to his name, his second also coming as a substitute in the Checkatrade Trophy game against Millwall. Hinds becomes the second U18s player to leave Kenilworth Road this term, with defender Cameron McJannet joining Premier League Stoke City in the August transfer window.